Take a look at how you identify exponential behavior from a pattern in your data. 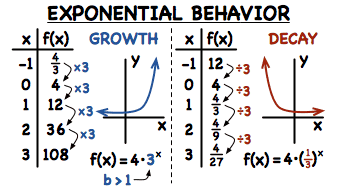 You'll also see how to figure out if that pattern represents exponential growth or exponential decay. Check it out! How Do You Graph an Exponential Function Using a Table? Graphing an exponential function? No sweat! Create a table of values to give you ordered pairs. Then, plot those ordered pair on a coordinate plane and connect the points to make your graph! Follow along with this tutorial as it shows you all the steps.